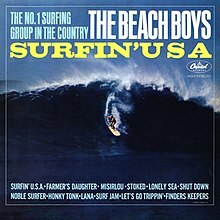 For the album's title track, see Surfin' U.S.A. (song). Surfin' U.S.A. is the second album by American rock band the Beach Boys. It reached number two in the US, lasting 78 weeks on the albums chart, eventually being certified gold by the RIAA, and brought the group newfound national success. It was led by one single, its title track with the B-side "Shut Down". In the United Kingdom, the album was belatedly released in late 1965, reaching number 17. The majority of the album's recording commenced in the first week of 1963, three months after the release of Surfin' Safari. Like the group's debut album, production was credited ostensibly to Capitol's representative for Artists and Repertoire, Nick Venet, although bandleader Brian Wilson was heavily involved in the album's composition. The album marks the beginning of his practice to doubletrack vocals, resulting in a fuller sound. By the time I got to the album, SURFIN’ USA, I was more experienced at producing. The album SURFIN’ SAFARI was practice for me. ... This album showcased our voices. We were just kids, but we were serious about our craft. The point being that when you are given the chance, you do your best. ... I think that I was a good coach for the boys. I didn’t like second-rate vocals. It was either the best or nothin’, in my opinion. The boys picked up. We had a good understanding between us and I was their leader. We got it done relatively fast in the studio. ... On this album, we had gotten into a fast pace: almost athletic in nature. It was because "Surfin’ USA" was such a smash hit on the radio. It was the big time for us. ... Production-wise, this album was an early Brian Wilson production. The photograph that adorns the front sleeve was taken by artist/photographer/surfer John Severson during January 1960, showing California-based waverider Leslie Williams riding the winter swell at Sunset Beach (Oahu) in Hawaii. Intended for the front cover of Severson's Surfer magazine, the original negative was damaged during the color separation process and couldn't appear in print. When Capitol Records requested a suitable photograph for the new Beach Boys album Severson fixed the damaged image and sold it to them. If Surfin' U.S.A. didn't literally transform America into an endless beach, it added vivid dimension to California mythos and took it further than anyone would have thought. You could call The Beach Boys’ version of Southern California cutesy or callow or whatever, but what matters is that it captured a lack of self-consciousness—a genuineness—that set them apart from their peers. And it was this quality that came to define Brian’s oeuvre as he moved beyond and into bigger pop productions that would culminate in Smile. Dennis Wilson – harmony and backing vocals; drums except "Surfin' USA"
^ Trynka & Bacon 1996, p. 126. ^ Leaf, David (1990). Surfin Safari / Surfin U.S.A. (CD Liner). The Beach Boys. Capitol Records. ^ Wolk, Douglas (October 2004). "The Beach Boys Surfin Safari/Surfin U.S.A.". Blender. Archived from the original on June 30, 2006. Retrieved June 2, 2017. ^ Sanchez 2014, p. 32. ^ "Surfin' U.S.A. - The Beach Boys: Awards". AllMusic. ^ "UK Top 40 Hit Database". EveryHit. Paul Trynka; Bacon, Tony, eds. (1996). Rock Hardware. Hal Leonard Corporation. ISBN 9780879304287. This page was last edited on 12 March 2019, at 08:58 (UTC).